This is real and it's in Arizona. Yes. Over Easter weekend some friends and I backpacked to Havasupai Falls on a 2 day/1 night trip. It was an amazing trip and I highly recommend it. In the past I felt it was a daunting excursion based on anecdotes from acquaintances who had made the trip. 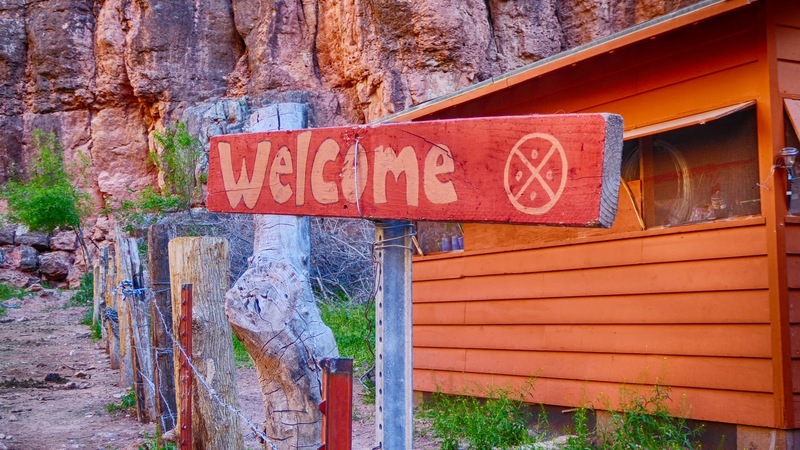 Whether they had tales of woe about getting a permit, or waxed hyperbolic about the rigors of the hike, or showed their ethnocentric side about the Supai community, it just seemed like a trip that was quite an undertaking. Well, it's not. So, if you had the same impression as me go ahead and try again. There are plenty of sites that can tell you about the beauties you will see on this hike, the history of the people and falls, etc., I won't repeat that information. Instead, I'm going to fill in some gaps in information and give you a general overview of the hike. Here's the official website-this is where you will find information on permits, etc. Here's the National Park Service site. Frankly, the most aggravating part of the whole trip was figuring out how far away the hilltop parking lot was. Google Maps says it's a 3 hour drive from Peach Springs. Other sites gave varying estimates like 2 hours from Kingman and my hair stylist said 45 minutes from Seligman. For those of you not familiar with your I-40 geography, just realize that's wildly inconsistent and completely unhelpful for trip planning. No resource I found acknowledged the inconsistencies so I didn't know who to trust. 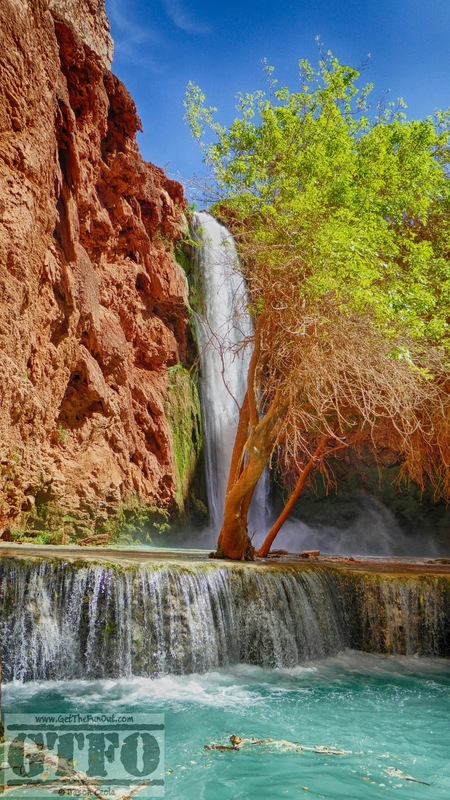 Havasupai Hilltop Campground is approximately 75 MINUTES FROM PEACH SPRINGS. Google Maps is WAAAAAYYYYY off and I cannot imagine how they arrive at their calculation. Indian Road 18 is paved and in generally good condition. There is NO basis for the calculation from Google Maps. Wherever you're coming from, map to Peach Springs or Grand Canyon Caverns (the two locations closest to Indian Road 18) then add 75 minutes to your travel time. That comes out to approximately 4.5 hours from Phoenix. We backpacked in and out in 2 days. It's not luxurious, but definitely do-able at 21 miles round-trip to Mooney Falls. 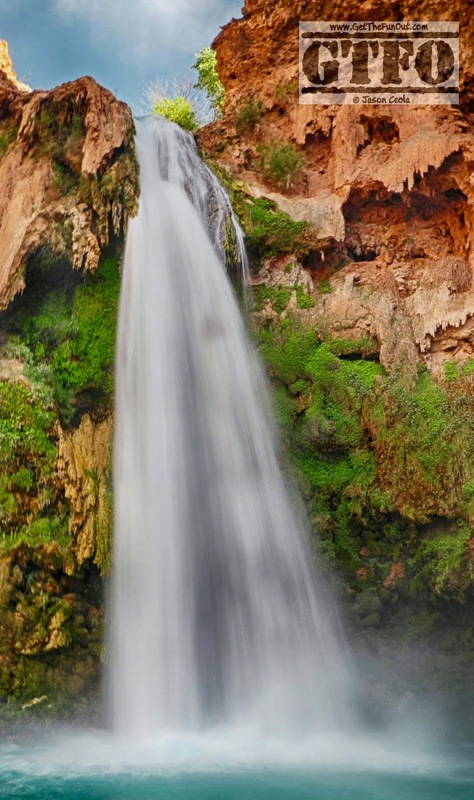 A person could reasonably drive up on a Friday, stay in a hotel between Seligman and Peach Springs, get on the trail by 7 AM Saturday, hike in and see Supai and Mooney Falls, pack out on Sunday and get back to Phoenix by Sunday evening. Others have said they camped at the hilltop campground... I'm not sure if that's allowed, so you could roll the dice and try or be responsible and call to check. We stayed in the Grand Canyon Cavern's Inn the night before. They also have a campsite if you prefer to rough it. A hundred bucks will get you a Spartan room with a king bed ($90 for two doubles) and a free continental breakfast starting at 5:00 AM. If I were doing it again, I would not choose the Inn because I'm a light sleeper and the noise from the heat/AC unit and the inability to get a comfortable temperature resulted in about 2 hours of sleep. The rest of our party did not have complaints. From the Inn we had about a 75 minute drive, respecting speed limits. Everyone says don't speed on tribal land because if you get a ticket they'll take you for everything. No one has said they have actually gotten the worst ticket ever, they just 'know' about it... Whether that's true or thinly-veiled racism, I don't know. But, tribes are sovereign entities and are generally free from state or federal oversight. I would rather obey the law than be subject to what amounts to a foreign justice system. Parking is a precious commodity at the hilltop. It's worth taking a loop through the cult-de-sac to check for openings rather than parking in the first space you find along the roadside. We saved about a half-mile walk by not taking the first spot. That half mile will feel like a dozen miles after you hike out. Best of all is the luscious lawn. The hike in is quite easy. The first mile of downhill requires attention to steps, but after that you're on a gradual downhill. Watch out for mules/horses and STAY TO THE INSIDE when they pass you. When you read that the animals will run you over, they LITERALLY will. Don't forget that. The hike in took us about 5 hours with a plenty of photo stops and a leisurely stop at the convenience store. Yes, there is a convenience store that has a full array of canned food, Gatorade and soda, and junk food. They also have fresh-made items like fry bread. By far the worst part of the hike is from the tourist office where you get your permit and the campsite. The trail is exposed to the sun and made up of very fine sand. Imagine a 2-ish mile walk on the beach, but no wet sand to make it easy. Congratulations, you're at the campsite! The campsite is heaven by comparison. 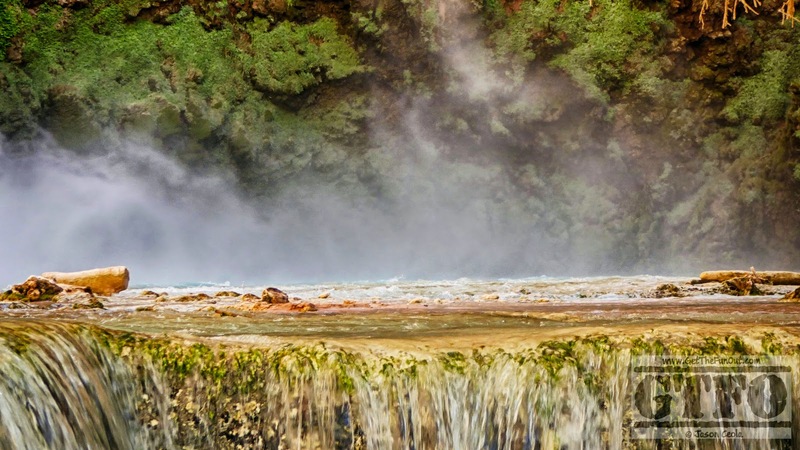 It is situated between Supai Falls and Mooney Falls along the stream and in the middle of an almost tropical forest. Despite the numbers of people you feel completely alone because sounds are drowned by the babbling water and the limited visibility imposes a sense of isolation. There are several, nice, outhouses. Toilet paper provided, but don't count on it always being stocked. There is fresh water from a spring. We did not find the need to filter or treat it. 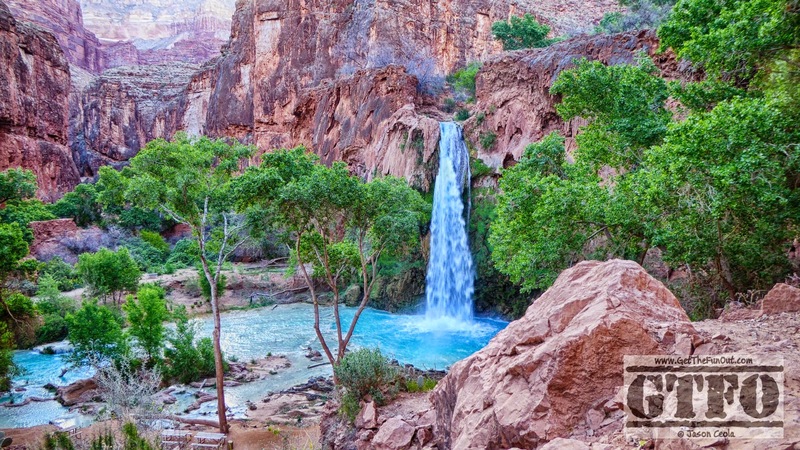 The falls: Supai is the first and most famous, and though it is deserved, I felt Mooney Falls was far superior. It is much larger, more removed from others, and just has a magical feel. The climb down is not treacherous, but certainly requires caution and attentiveness. There are rails, steps, and chains for support. Hiking out and breaking camp. Good grief, it took forever to break camp, eat, and potty. We got up at 5:30 and didn't get on the trail until around 7:30. Despite being remarkably more uphill than expected for the first 9 miles, we made it to the final incline by 10:30. The final incline took us another hour and it was taxing. It's hard to rate it, but judging by the variety of people we passed it seems do-able for anyone who is generally active. Remember that by the time you get here you are probably going to have full-sun exposure and plan accordingly. We were lucky to have wind the whole way, making the sun bearable. 3 liters of water was sufficient for the hike out, actually I had more than enough and probably should have drank a LOT more than I did. ﻿﻿Trip home - you have 75 minutes to the first opportunity to get snacks. Do yourself a favor and leave some food and drink in the car so you don't have to wait to eat.